There are moments when I face some bands that follow the old days’ formulas and I ask myself why everyone wants to be a new DEEP PURPLE or LED ZEPPELIN. But from times to time, we all discover bands that really hook us all to their musical work, even not sounding new. We can say that about the Swedish Classic Rock band BLACK PAISLEY. 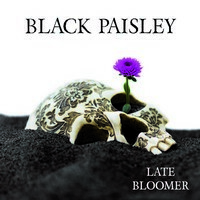 Their album, called “Late Bloomer”, is a festival of excellent songs and great melodies. Their melodies and musical arrangements come from the late years of the 60s and earlier years of the 70s. As I mentioned above, it’s a Classic Rock band, so don’t expect something bitter or aggressive as BLACK SABBATH, but they are too near of bands that uses a melodic orientated sound with folk influences (sometimes, you’ll feel some influence of Bob Dylan on their songs), with musical arrangements that are easy to be assimilated, very good use of the keyboards parts, fine work from bass guitar and drums on the rhythmic session, good guitars and excellent melodic vocals. Once more: they aren’t doing something new, but it is really great in this way. Although they work with an organic way of sound, with tunes that are truly near of those analogic ones from the 70s, we hear clearly that the production is truly modern, giving the essential clear sound that they need. Of course it is a very good thing, because they fused the benefits of the modern recordings to build a very good sound quality. On the nine songs of “Late Bloomer”, we have that feeling that they found a great way to make music with their own personality. The album’s best moments can be found on the nasty melodies and great keyboards parts of “Run Run Run”, the tender and fine atmosphere created by guitars and vocals on “Easy” (what a lovely and catchy ballad), the psychedelic feeling on bass guitar and drums tempos of “Ordinary Day”, the introspective harmonies heard on “Autumn”, the very accessible feeling that flows from “Kickin’”, and the amazing catchy arrangements of “It Ain’t Over” (very good chorus) and “Coming Home”.